Syllabus of the Online Course (Subject): Africa-South America Summit (ASA). UNASUR-African Union. Description of the Online Course: Africa-South America Summit (ASA). 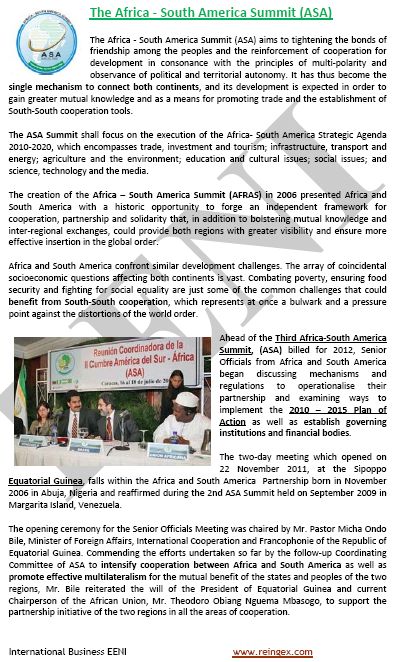 The Africa-South America Summit (ASA) should focus on the implementation of the Africa-South America Strategic Agenda 2010-20, which includes international trade, international transport, foreign direct investment (FDI), tourism, infrastructure, energy, agriculture, environment, education, and technology. The Africa-South America Summit is integrated by fifty-four African Countries and twelve South American countries (members of the Union of South American Nations). The members of the South American Community of Nations (UNASUR) are Argentina, Brazil, Bolivia, Colombia, Chile, Ecuador, Guyana, Paraguay, Peru, Suriname, Uruguay, and Venezuela. The members of the African Union (AU) are Algeria, Angola, Benin, Botswana, Burkina Faso, Burundi, Cameroon, Cape Verde, the Central African Republic, Chad, the Comoros, Congo, Ivory Coast, the Democratic Republic of the Congo, Djibouti, Egypt, the State of Eritrea, Ethiopia, Equatorial Guinea, Gabon, the Gambia, Ghana, Guinea, Guinea-Bissau, Kenya, the Kingdom of Lesotho, Liberia, Libya, Madagascar, Malawi, Mali, Mauritania, Mauritius, Mozambique, Namibia, Niger, Nigeria, Rwanda, São Tomé and Príncipe, Senegal, the Seychelles, Sierra Leone, Somalia, South Africa, Sudan, the Kingdom of Swaziland, Tanzania, Togo, Tunisia, Uganda, Zambia, and Zimbabwe. From the religious point of view, the Summit of the South America - Africa consists of Christian and Muslim countries. The creation of the Africa-South America Summit in 2006 presented Africa and South America with a chance to build an independent Framework for Cooperation, regional partnership and solidarity that, furthermore, to develop mutual knowledge and inter-regional trade, could supply to Africa and South America with greater visibility and guarantee more efficient introduction in the global economy. The South America-Africa Summit (ASA) is an inter-civilisation agreement between the economic spaces of Islamic Civilisation, African Civilisation and Western Christian Civilisation (Latin American Economic Area).